The Southeast United States faces unprecedented challenges to its water supply. 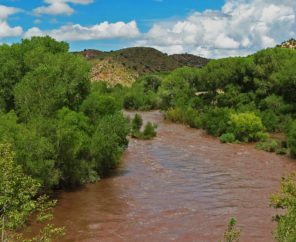 Growing populations and the impacts of climate change are putting new strains on communities and their rivers. Our local leaders are facing the pressing question of how to ensure a clean, reliable water supply for current and future generations. Traditionally, building more dams and reservoirs was the first and only answer to water supply problems. But these 19th century approaches should not be the primary solutions for our new 21st century challenges. They don’t address the root problem — water is finite and we are not using the water we do have wisely. Relying solely on building large new dams is not costeffective and it won’t solve today’s water needs. Per gallon, dams cost up to 8500 times more than water efficiency investments. Dams are fixed in one place and hold a limited amount of water. Even when we do get sufficient rains to fill reservoirs, these giant pools can lose tremendous amounts of water through evaporation. For these reasons, building new dams should be the absolute last alternative for solving our water supply needs. Hidden Reservoir makes the case that water efficiency is our best source of affordable water and must be the backbone of water supply planning. 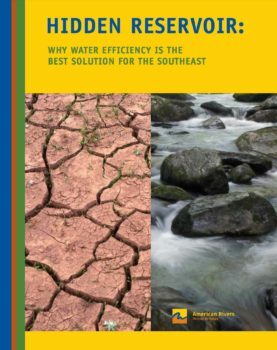 By implementing the nine water efficiency policies outlined in this report, communities across the Southeast can secure cost-effective and timely water supply.